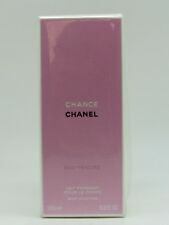 Chanel Chance Eau Fraiche 100 ML 3.4oz EDT Eau De Toilette. Condition is New. Small Pocket-Sized Bottle 5ml. Fragrance is 100% Authentic! Listed as used because the box shows minor signs of storage wear. What You See in the Pictures is EXACTLY What You’ll Get. The penny was used to show the actual size of the bottle. You will receive the item(s) as shown in the above picture(s). 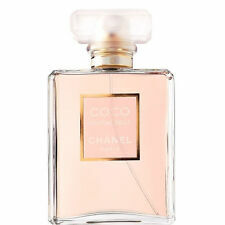 (1) CHANEL EAU VIVE 5 ML SPRAY - TRAVEL ATOMIZER / DECANT SPRAY -. A glass atomizer is used to preserve the quality of the fragrance. FRAGRANCE MART NY. Each sample contains authentic and undiluted fragrance. Size - 10 ML. We do not represent that they are exact copies; therefore they do not violate any copy right laws. Buy 1, Get 1 40% off. Condition - New. 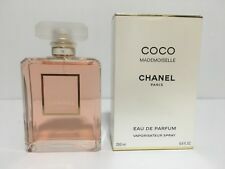 Brand: CHANELSize: Less than 1oz. Full bottle imperfect bottle, contains scratches scuffs, spot on bottle, no cap no box as pictured. Discontinued, almost impossible to find. You will receive 1 travel sample size 1 g. (.05 oz) net weight as in photo (the large container is not for sale.). Condition is Used. The fragrance appears to hover weightlessly within the exceptional square bottle, crafted of ultra-thin glass. The 4 transparent sides fade into the background allowing the light-filled fragrance to shine through. 2018 Bleu De Chanel INTENSE PARFUM Cologne Samples 2ml 5ml10ml, PARFUM not EDP! Refreshing Body Mist. Full Size 2.5 oz. / 75ml Spray. They are of the Actual item you will receive. This is NEW & NEVER USED. Many listed are USED. New/ Never Used/No Box. 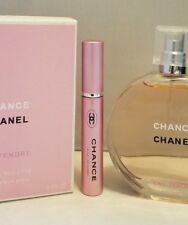 New Chanel Chance Eau Tendre EDT Sample Spray 1.5ml/0.05oz Perfume Fragrance. Condition is New. Shipped with USPS First Class Package. BRAND NEW CARDED 1.5ml Sample Never used, never tested, never sprayed From Sephora Ships out fast! Ending Apr 29 at 6:59PM PDT4d 19hTop Rated PlusBrand: CHANELSize: 1.0oz.-2.0oz. Chanel No. 19. This fragrance has not condensed and appears to have maintained all of its original notes. BOTTLE SIZE Any item sold by the Seattle Goodwill is eligible for local pick up at our warehouse. Ending Apr 29 at 7:01PM PDT4d 19hTop Rated PlusBrand: CHANELSize: 1.0oz.-2.0oz. Ending Apr 28 at 8:44AM PDT3d 8hBrand: CHANELSize: 3.1oz.-5.0oz. Our interpretation of these fragrances is created through careful chemical analysis and reproduction. We do not represent our products to be original nor do we represent them to be exact copies. Bleu De Chanel Parfum (intense). Released in 2018. Condition is gently used. Th an ks f or l oo ki ng a t my a uc ti on a nd h av e a bl es se d we ek ! Only sprayed once. Ships same say as purchase! Bleu De Chanel PARFUM. Sample / Vial Size Spray 4 X 1.5ml. NEW Lot of 4. You Buy ONLY 5ml SAMPLE in Glass Sprayer. Ending Friday at 5:10AM PDT1d 5hBrand: CHANELSize: Less than 1oz. New Chanel 15 piece lot. Chanel 15 piece lot. Has 4 deluxe sample mascaras, and what you see in the pics is what you will get. 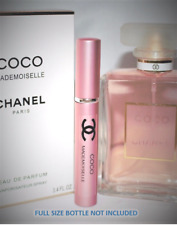 Chanel Cristalle Eau De Parfum Vaporisateur 1.7 Fl. Chanel - Paris. Eau De Parfum. 50 mL - 1.7 Fl. We will reply to you As Soon As Possible. Condition is Used. The original held 5 bottles but one is missing. Size - 10 ML. We do not represent that they are exact copies; therefore they do not violate any copy right laws. Condition - New.